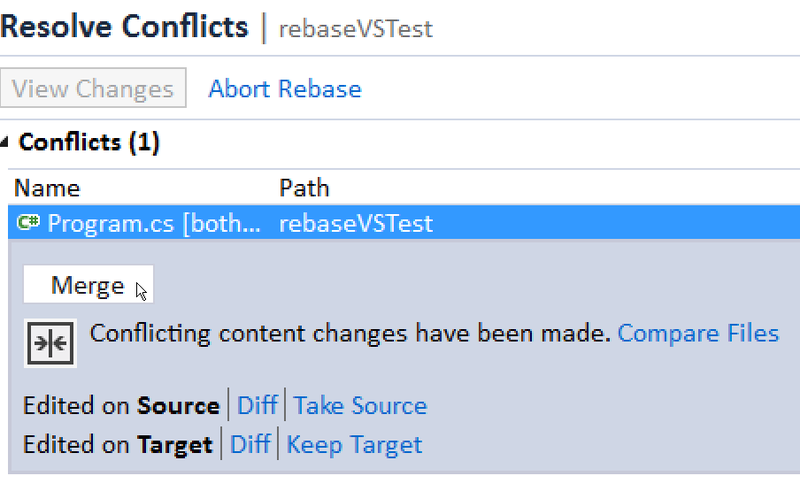 Similar to yesterday’s tip, but today, you’ll see how to resolve a conflict when rebasing within Visual Studio. 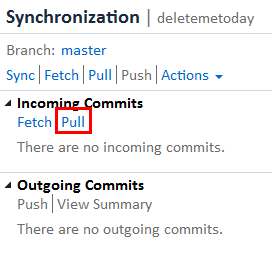 Suppose you have the same line in the same file modified in different branches. 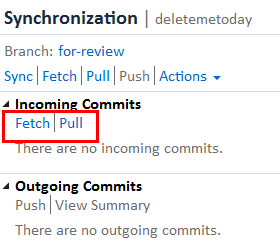 Just something simple to trigger a merge conflict. 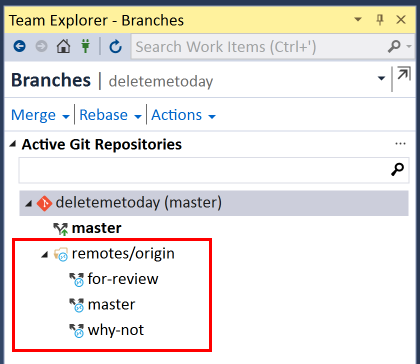 Or more likely, you’ve added one file in master and you’ve added another file in an experiment branch. 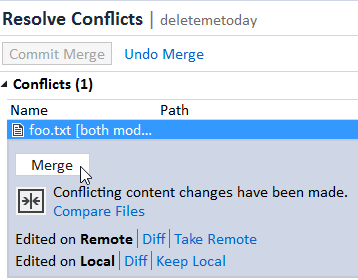 Then you get a conflict when rebasing because your project file needs help merging the two newly added files. 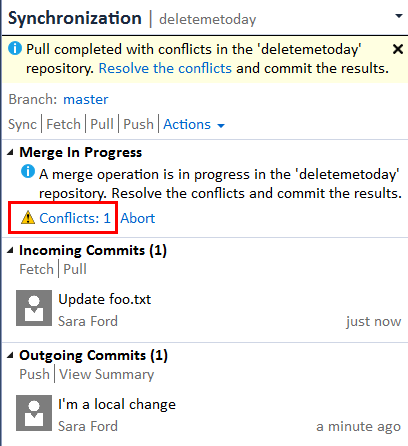 First, you’ll get the message that there are conflicts. Click on the Conflicts: 1 link. 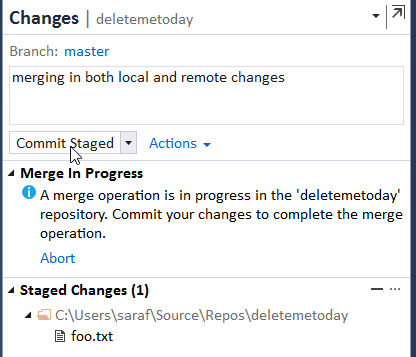 Clicking on the Merge button will bring up the built-in merge tool. 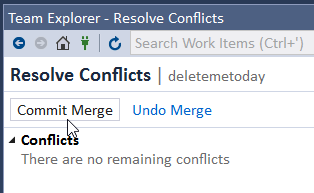 Make whatever selections you want, and then hit Accept Merge. 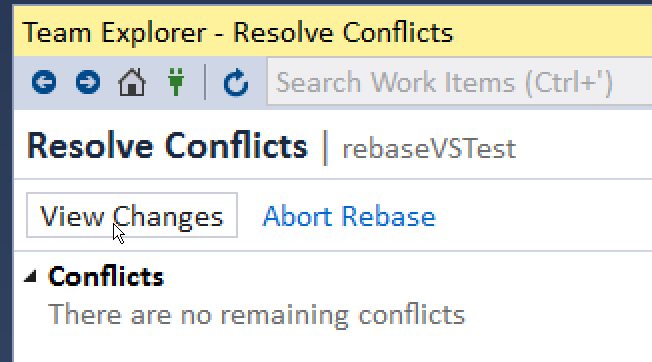 Now View Changes, as you’ve resolved the conflicts, but still need to finish the rebase. 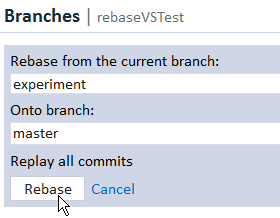 And now you’ll see that the experiment branch has been merged onto master. 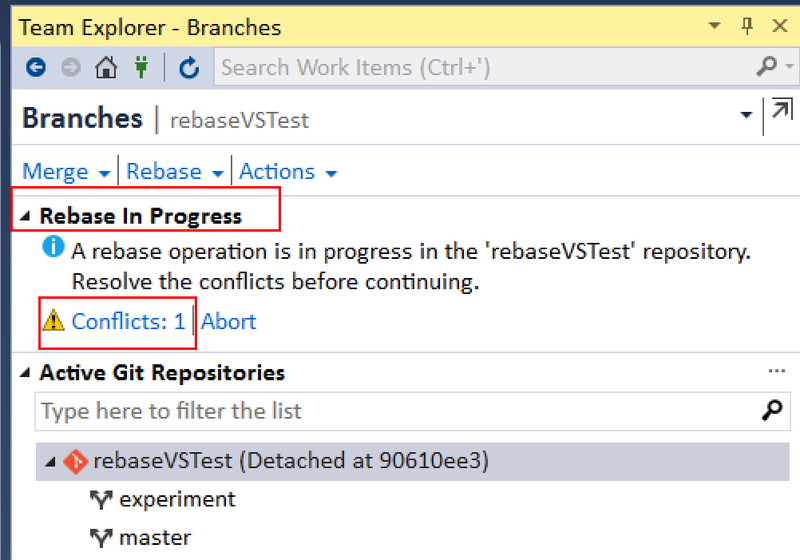 Suppose you’ve added a new file to your solution in a branch called `experiment` for experimental purposes. 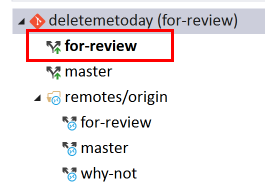 You are happy with this new file and want to merge this back into master. 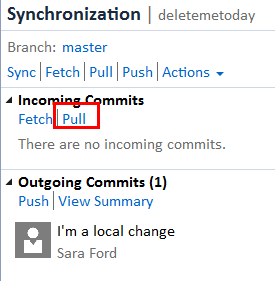 Well, let’s say you (or someone like you*) made a change in master. 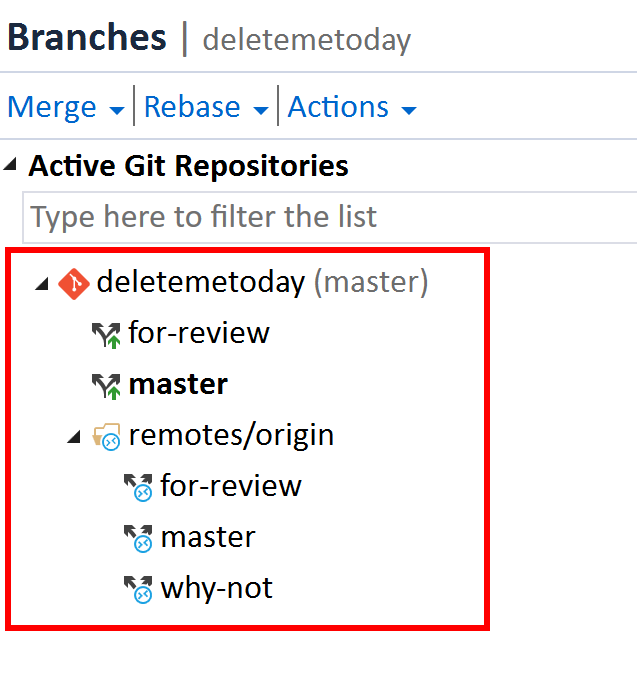 Notice how the tip of experiment has a commit that’s not in Master, and vice versa, the tip of master has a commit that’s not in experiment. 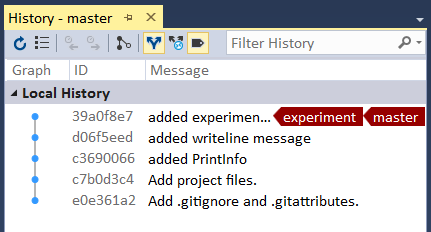 First, we’ll use Team Explorer to rebase experiment unto master. 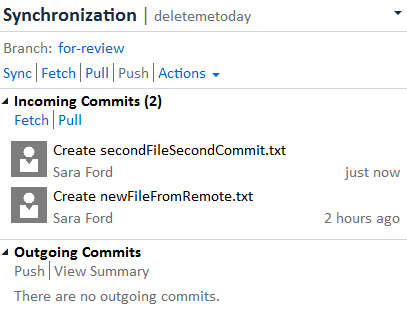 BTW I love how Team Explorer uses full sentences to confirm your intent. 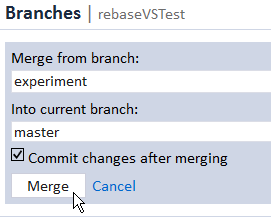 And lastly, let’s get master caught up to experiment by doing a merge. Yay for full sentences in the below image! 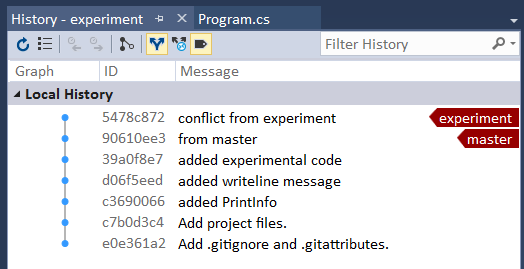 And now when you refresh Master history, you’ll see the changes.